There comes a time in your fishing career when you wonder as to what tool to use as an angler to improve your performance. Of course, there are many tools out there, but you would be looking for tools to consistently match up with your evolving skillset. This is the point where you should look for a good Baitcasting Reel. It as an essential tool and it is the best tool to use if you want to gain more control and precision in your fishing adventure. Baitcasting reels commonly called “baitcasters” are generally considered as the best fishing reels and are widely used by anglers who have a solid experience honing up their skill. This may be the right tool you need to get to take your fishing experience to a whole new higher level. 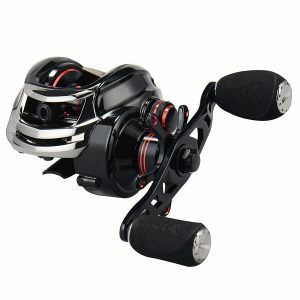 How to Choose Best Baitcasting Reels? When you resolve to but a baitcasting reel, there are some things you should consider so that you can get a good one. They are found in both right and left-hand types with the right models being the most common. Unlike spinning reels, baitcaster’s handles cannot be swapped out — most anglers who are right-handed use right-handed reels. Despite this, whenever you make a cast, you would still have to switch the reel to your left hand, and you use your right hand to hold and turn the handle. However, this is not s for left-hand baitcasting reels. Therefore, your choice of hands is pivotal to the model you would want to opt in for. Although if you don’t want to be switching hands, it is advisable that opting in for the reel which has the same configuration as your spinning reel set up would be best. Furthermore, taking a close look at the following would help you in making the best choice for yourself. You may be wondering what a gear ratio is. Well, it refers to the number of times the spool rolls over when you rotate the reel’s handle once. For you to choose the right baitcasting reel, first is to look for the right gear ratio which is very important. This is because the gear ratio affects the speed at which your lure is pulled back. At times, you may find the gear ratio on some reels and at times not. The mechanism of working of the gear ratio is simple and this just how easy it works. If the reel has a gear ratio of 5:0, it implies that the spool turns five times when you rotate the handle once. This means that the higher the first number of the ratio, the quicker the lure is pulled back to you. Different ratios are best suited for different types of lures. A gear ratio of 5:1 is generally regarded to be the average with 4:1 and 6:1 considered to be slow and very fast respectively. A slower gear ratio as low as 3:1 is recommended to be best suited for diving crankbaits and large spinnerbaits. An average speed gear ratio of 5:1 is recommended for Texas rigs, soft plastics and jigs while for other lures and some spinnerbaits, a pretty fast gear ratio of 6:1nto 7:1 should be considered. The braking system in baitcasters is also very crucial as they help in adjusting and reducing the speed of the spool’s rotation during the cast. You would definitely want to avoid knotting of the lines when your spool incessantly continues to rotate, i.e., the backlash by applying the reels breaks. The adjusting of the spool speed, the spool tension knob is what to use. It is located on the reel handle side and if you tighten it enough, your lure will draw slowly to the ground whenever you release the reel. As soon as the lure reaches the ground, the spool would stop to rotate almost at the same time. When deciding on the break, there are two types you can choose from; the centrifugal and the magnetic breaking system. The centrifugal breaking system depends on the friction and centrifugal force and uses pins inside the side plate of the reel to function. The pins extend out when there is increased speed of the spool’s rotation. Therefore, to apply the break in this system, you will have to push the pins to the outside. For magnetic breaking system, its mechanism of work is rather quite different all though depends on the magnet and spool to function. It is worthy of note that irrespective of the breaking system that comes with the baitcaster reel, learning to how to thumb the spool perfectly is very important and it is pivotal to having a hassle-free casting. The magnetic system seems more complicated and you may want to fit the centrifugal type if you feel it could be difficult for you to operate. The next thing to take note of when making a purchase is the spool size of the reel. If you are interested in going for a bigger or stronger fish during your fishing adventure, you will definitely need to get a heavier line. For such heavier lines, you would agree that they would take more space on the spool and hence, you may have to consider buying a reel which has a deeper spool and has enough space to hold the line of your choice completely. Impliedly, the bigger the size of the fish you are aiming at, the larger the size of the spool you will need. An important thing you should always do is to go for the best and comfortable tool. You shouldn’t trade that for anything as you wouldn’t want to spend the after-fishing time nursing the pain gotten from using a tool. Therefore, if your choice of baitcasting reel doesn’t offer you maximum comfort-ability when you hold, it would hinder you from being a skilled angler. A comfortable grip and balanced combination of rod and reel would help you achieve more accuracy and improved casting. We have tested out different baitcasting reels and their working mechanism along with their features such as tensioners, drag settings, thumb latches, and others. Additional things to consider when buying a baitcasting reel are the frames and ball bearings. Their frames are either machined or die cast. They are made from two different materials of aluminum or graphite and at times a mixture of the two. Durable and quality frames are usually made from a single strand of material. Ball bearings are featured to allow the free run of the reel and provide support to the gears too. Here, quality takes priority over the number and quantity. Therefore you should look out for those signed as stainless, or shielded or double shielded. 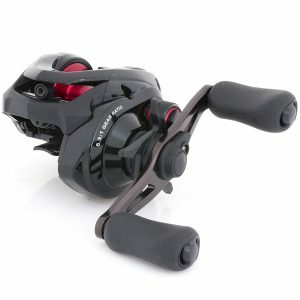 We have made a good list of baitcasting reels according to their price range. This will equip you with enough information and all you need to make the best choice while putting your budget in check. This is an excellent baitcasting reel that showcases an excellent manufacturing process in both the design and material quality. The Shimano Chronarch MGL baitcasting reel is a casting reel that delivers top-level performance tournament that enthusiastic anglers require. The Shimano Chronarch MGL baitcasting reel has both left-handed and right-handed retrieve available with three gear ratios in 6.2:1, 7.1:1, 8.1:1. The retrieve range from 26 – 34 (in). These features make the retrieve enjoyable while fishing. The Shimano Chronarch MGL baitcasting reel has a very lightweight Magnumlite spool, and this allows a low moment of inertia which eventually require very little force to get it spinning. This unique feature makes the lures cast farther with less effort than it used to require. This is another outstanding feature that makes the Shimano Chronarch MGL baitcasting reel unique. This baitcasting reel has a very stable spool design which reduces spool vibration, consistent spool control and makes it very easy-to-manage. The micromodule gear system is another excellent feature the makes Shimano Chronarch MGL baitcasting reel user-friendly. This creates a smooth retrieve with a better positive feel when using the baitcasting reel for fishing. The Shimano Chronarch MGL baitcasting reel is easy to handle. This baitcasting reel has a handle length of 90mm and this contributes largely to its peculiar usefulness in fishing in freshwater. ShinamoChronarch MGL baitcasting reel is made of a very stable spool design that reduces spool vibration, a micromodule gear system that creates smooth retrieve, consistent spool control, and brake system. The baitcasting reel has 6.5 weight range (oz), retrieve range 26-34(in), with 14g spool weight, and handle length of 90 (mm). This is another baitcasting reel with fascinating design and material quality. 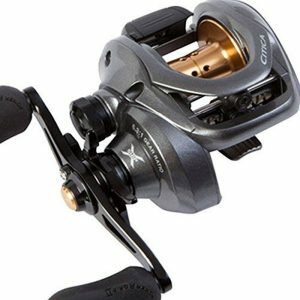 Shimano Curado l reel is equipped with a rigid metal Hagane body for supreme impact resistance, as well as X-ship and super free spool technologies. It is a baitcasting reel that will completely change up your fishing game for the better. The Shimano Curado l reel consists of super free spool technologies. The super free spool technologies help to lessen friction on the pinion gear and spool shaft. And in this invariably enhances smooth casting and retrieve without backlashing. This is another outstanding feature that makes the Shimano Curado l reel unique. This baitcasting reel has a very stable spool design which lowers spool vibration, consistent spool control and makes it very easy-to-manage. The Shimano Curado l reel has an embedded SVS infinity technology. This technology adds control, and the brake weight helps to maintain speed. 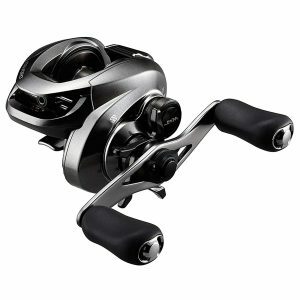 The Shimano Curado l reel has a metal Hagane body which is ultra-rigid and impact resistant. This helps to reduce flexing and allow more cranking power. The Shimano Curado l reel is easy to handle and operate. The possibility of experiencing a smooth casting and retrieving to its peculiar usefulness for an enjoyable fishing experience. The Shimano Curado l reel has a low profile design that offers a consistently thin wall to help lower vibration and enhance smooth casting and retrieving. The baitcasting reel weighs 7.2 oz, with a monofilament line capacity of 8/180, 10/155, and14/110, and a line retrieve per crank of 26”. All these great features culminate to make Shimano Curado l reel a superb reel for your freshwater and saltwater fishing game. The Lew’s Fishing Tournament MB Baitcast reel is light weighted. The reel weighs only 6.7 ounces and this allows a low moment of inertia which eventually requires very little force. This feature makes the lure cast farther with less effort. The Lew’s Fishing Tournament MB Baitcast reel has a dual-braking Multi-setting braking system. This baitcasting reel combines both a magnetic cast control and a centrifugal braking system. This fantastic feature makes it very user-friendly and effective baitcasting reel. The Lew’s Fishing Tournament MB Baitcast reel has dual hand orientation. The left-hand and right-hand orientation make the retrieve enjoyable for fishing. The Lew’s Fishing Tournament MB Baitcast reel is easy to handle and operate. The smooth operation with backlash avoidance adds to its peculiar usefulness for an enjoyable fishing experience. The Lew’s Fishing Tournament MB Baitcast reel is lightweight with dual-braking MSB and in available in dual hand orientation. The baitcasting reel weighs 6.7oz, with a line capacity of 12/120, Bearings of 9BB+1RB, and the Gear ratio of 5.6:1. All these great features culminate to make the Lew’s Fishing Tournament MB Baitcast reel an excellent reel for your fishing game. The Lew’s Fishing Team Pro Magnesium LFS features a built-in Speed keeper and Hook keeper. The built-in Speed keeper and Hook keeper helps to keep a detailed record of speed and hook, and it retracts out of the way when not in use. It is a unique and different feature. The Lew’s Fishing Team Pro Magnesium LFS features a speed dial indicator. The speed dial indicator helps to keep track of what type of line and weight has spooled. It is extremely useful to monitor if the weight has been added on the reel. This reel has a very lightweight spool. The spool only weighs 5.5 oz, and this makes it extremely useful for your fishing game. The Lew’s Fishing Team Pro Magnesium LFS is easy to handle. It will give you a thrilling fishing experience. The Lew’s Fishing Team Pro Magnesium LFS reel offers a compact one-piece magnesium frame. 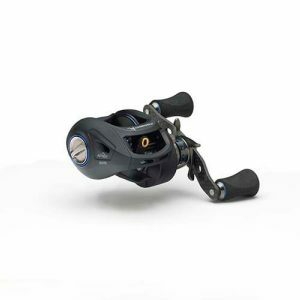 It is an excellent baitcasting reel with strong, lightweight carbon C45 carbon side-plates and double anodized gold detail finish with a built-in speed keeper and hook keeper. The baitcasting reel weighs only 5.5 oz, Bearings of 10+1, the Line capacity of 120/12 and gear ratio of 6.8:1 and has an Inches per Turn to be 28″. It is compatible with bass fishing and applicable in both saltwater and freshwater. The 13 Fishing Concept A3 6.3:1 Gear Ratio Fishing Reels has Ocean armor 2 saltwater protection. This feature enables you to be able to make use of it in seawater without you losing you your priced equipment. The 13 Fishing Concept A3 6.3:1 Gear Ratio Fishing Reels features a new H.A.M gearing system. This gearing system creates a smooth retrieve with a better positive feel when using the baitcasting reel for fishing. The 13 Fishing Concept A3 6.3:1 Gear Ratio Fishing Reels is easy to handle, operate and manipulate. With this spectacular feature, you will have a better fishing experience. 13 Fishing Concept A3 6.3:1 Gear Ratio Fishing Reels is a dual handed baitcasting reel. It features Ocean armor 2 saltwater protection, new H.A.M gearing system and a dead stop anti-reverse system. This is a great baitcasting reel that you can have for a remarkable fishing experience. It has a gear ratio of 6.3:1 and 30+lb maximum drag. This is a baitcasting reel that displays an exquisite material quality and design. 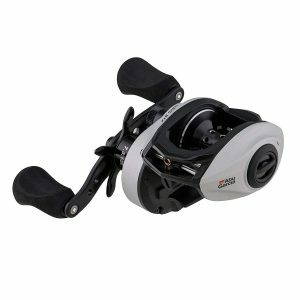 Lew’s Fishing TPGISH Tournament Pro G Speed Spool Reel is a casting reel that features a lighter, faster and stronger one-piece skeletal aluminum frame with carbon side plates. The Lew’s Fishing TPG1SH Tournament Pro G Speed Spool reel features a built-in Speed keeper and Hook keeper. The built-in Speed keeper and Hook keeper helps to keep a detailed record of speed and hook and it retracts out of the way when not in use. The Lew’s Fishing TPG1SH Tournament Pro G Speed Spool reel features a speed dial indicator. The speed dial indicator helps to keep track of what type of line and weight has spooled. It is extremely useful to monitor if the weight has been added on the reel. The Lew’s Fishing TPG1SH Tournament Pro G Speed Spool reel has a lightweight spool. The spool weighs 6.2 oz, which makes it reach the appropriate weight useful for you in fighting. The Lew’s Fishing TPG1SH Tournament Pro G Speed Spool reel is easy to handle, operate and manipulate. This Baitcast reel will give you a thrilling fishing experience. The Lew’s Fishing TPG1SH Tournament Pro G Speed Spool reel offers a one-piece aluminum skeletal frame. It is an excellent baitcasting reel with carbon side plates. It has built-in speed keeper and hooks keeper. The baitcasting reel weighs 6.2 oz., Bearings of 10+1, the Line capacity of 120/12 and gear ratio of 7.5:1 and has an Inches per Turn to be 31″. It is compatible with bass fishing and applicable in both saltwater and freshwater. The Abu Garcia Revo SX Low-Profile Baitcast Fishing Reel features an ultra-lightweight design that allows a low moment of inertia which eventually requires very little force. This ultra-lightweight design makes the reel 25% lighter than the previous generation. 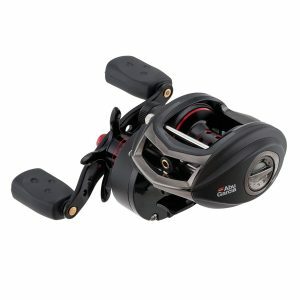 The Abu Garcia Revo SX Low-Profile Baitcast Fishing Reel features a carbon matrix drag system. This carbon matrix system provides a smooth and consistent drag and this distinguishes the baitcasting reel from its counterpart. The Abu Garcia Revo SX Low-Profile Baitcast Fishing Reel features the D2 Gear design, Dura gear system, and the titanium-coated line guide. These features uniquely provide efficiency and long-lasting durability for the baitcasting reel for high ranked effectiveness. The Abu Garcia Revo SX Low-Profile Baitcast Fishing Reel has X2-Craffic alloy frame as one of its main features. And this X2-Craffic alloy frame increases corrosion resistance which invariably makes the baitcasting reel retain its proper form. The Abu Garcia Revo SX Low-Profile Baitcast Fishing Reel is easy to handle and maneuver. This means you can operate the reel in confidence with no fear of the unknown. The Abu Garcia Revo SX Low-Profile Baitcast Fishing Reel offers cutting-edge features and ultra-responsive performance. It has great features which include the X2-craffic alloy frame, excellent gear design, and system, a carbon matrix drag system, and an extended belt cracking handles. It has 9 stainless steel ball bearings+1 roller. It features a T-wing system. T-wing System makes it easy to adjust and make micro adjustments to cast into the wind. Therefore, this baitcasting reel becomes more comfortable to use for you as an angler. 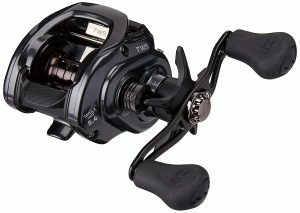 The Daiwa TatulaBaitcasting reel features a corrosion resistant clutch mechanism. This clutch mechanism induces the corrosion resistance which in turn maintain the excellent form of the baitcasting reel and makes it last long. 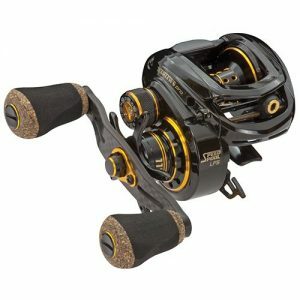 The reel features an ultimate tournament carbon drag (UTD). The UTD provides a smooth and consistent drag which has 132 lb. Drag max. The Daiwa TatulaBaitcasting reel is easy to handle, operate and manipulate. This Baitcast reel will give you a wonderful fishing experience as an angler. The Abu Garcia Revo SX Low Profile Fishing Reel features an ultra-lightweight design that allows a low moment of inertia which eventually requires very little force without sacrificing strength and durability. The Abu Garcia Revo SX Low Profile Fishing Reel features a power stack carbon matrix drag system. This carbon matrix drag system provides extreme drag pressures combined with unpatrolled smoothness. The Abu Garcia Revo SX Low Profile Fishing Reel features the D2 Gear design, Dura gear system, and the titanium-coated line guide. These features uniquely provide efficiency and long-lasting durability for the baitcasting reel for high ranked effectiveness. The Abu Garcia Revo SX Low Profile Fishing Reel has X2-Craffic alloy frame as one of its main features. And this X2-Craffic alloy frame increases corrosion resistance which invariably makes the baitcasting reel retain its good form. The Abu Garcia Revo SX Low Profile Fishing Reel is easy to handle and maneuver. This means you can operate the reel in confidence with no fear of the unknown. The Abu Garcia Revo SX Low Profile Fishing Reel offers cutting-edge features and ultra-responsive performance. It has great features which include the X2-craffic alloy frame, excellent gear design, and system, a carbon matrix drag system, and an extended belt cracking handles. It has 9 stainless steel ball bearings+1 roller bearing. The Abu Garcia Revo STX Low Profile Fishing Reel has X2-Craffic alloy frame as one of its main features. And this X2-Craffic alloy frame increases corrosion resistance which invariably makes it retain its good form. This Reel has Dragger bass gear. This Dragger bass gear allows for a gear extended life. With this baitcasting reel, you will be able to confidently use it effectively without the fear of the unknown. It features a power stack carbon matrix drag system. This carbon matrix drag system provides extreme drag pressures combined with unpatrolled smoothness. The Abu Garcia Revo STX Low Profile Fishing Reel offers exceptional features and excellent performance. The exceptional features include the X2-craffic alloy frame, Dragger bass gear, a power stack carbon matrix drag system, and an extended belt cracking handles. It has 10 stainless steel ball bearings+1 roller, and it is applicable in both freshwater and saltwater. The Lew’s Fishing Tournament MB Baitcast reel has a lightweight. The reel weighs only 6.7 ounces and this allows a low moment of inertia which eventually requires very little force. This feature makes the lures cast farther with less effort. If you are looking to get a reel which is light, and has a fast retrieve, the Ardent Apex Elite Fishing reel is just the one to go for. This reel is designed for superior performance on the water. Being built with a premium 12+1 ball bearing system, it provides a long casting ability with the mag brake system. It features a carbon fiber handle and also offer a firm grip and greater power when cranking hard. This reel is very light in weight, and this makes it suitable for bass fishing. Because of its lightness, you can easily cast it for several hours without been overly stressed. The Ardent Apex Elite Fishing Reel features a very efficient aluminum drag system which implies that you get an impressive, smooth and high-quality drag pressure anytime you are fishing. This also helps to reduce the risk of experiencing a backlash when fishing. This reel features a machined aluminum spool which is deep and can hold as heavy and lengthy as the possible line. Therefore, with this feature, you wouldn’t have to be bothered about not having enough line or space to hold them, especially when going out to get a large fish. Having an aluminum spool and drag system also makes this reel a good fit for fresh water fishing. The Ardent Apex Elite Fishing Reel is one type baitcasting reel with great and exciting features. It features a high strength aluminum frame; carbon fiver swept back handle with EVA grips and externally adjustable 270-degree magnetic brake system. It has the dimension of 4 x 4 x 3 inches and weighs 6.1 ounces. It comes with both the left- and right-hand retrieve and available in 6.5:1 and 7.3:1 gear ratios. The Shimano Citicabaistcasting reel has both left-handed and right-handed retrieve available with gear ratios, 5.5:1, 7.2:1, and 6.3:1. The retrieve per crank range from 26 – 30 (in). These features make the retrieve enjoyable while fishing. This is another outstanding feature that makes the Shimano Citicabaistcasting reel unique. This baitcasting reel has an S3D spool which reduces spool vibration, and consistent spool control. The Infinity SVS Braking System is another excellent feature the makes Shimano Citicabaistcasting reel user-friendly. This creates a smooth retrieve with an easy-to-manage feel. The Shimano Citicabaistcasting reel is easy to handle. This baitcasting reel has a handle length of 90mm, and this contributes largely to its peculiar usefulness in fishing in freshwater. 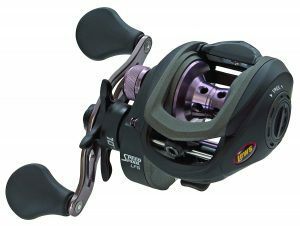 The Lews Speed Spool LFS Baitcasting Reel is a reel you would want to have just at first sight because is very smooth and attractive. It has interesting features which make it a top pick for most anglers one of which is that it offers great casting control. It can withstand corrosion and hence is mostly used for saltwater fishing. 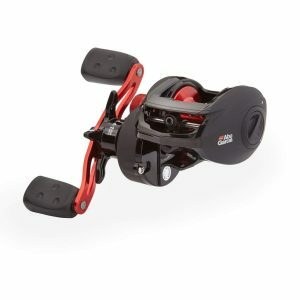 The Lews Speed Spool LFS Baitcasting Reel features a one-piece die-cast aluminum frame with easily removable palming graphite sideplates which is exceptionally rigid and keeps all parts of the reel in a compact shape. As loaded as the speed spool is with features, it is light and weighs only 7 ounces which are incredibly low as compared to most baitcasting reels. I can be handled for long hours during fishing without straining your hands. The Lews Speed Spool LFS Baitcasting Reel’s drag system is rugged and fascinating. It is claimed to be strong enough to hook and capture big fishes and gives you full control especially when in a fight faceoff with a fish. The maximum drag pressure that this reel can withstand is 10lb. This is a lot for such a light and solid fishing reel. The Speed Spool Reel’s casting control is very incredible which is as a result of its externally adjustable magnetic brake system. The cast control has been established to be easy to use by most anglers because it can be externally adjusted from 0 to max. 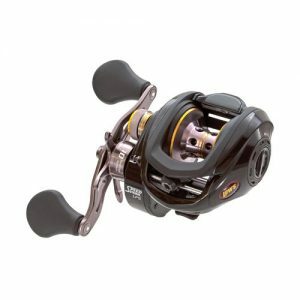 This reel is an exceptionally low profile baitcasting reel which takes fishing to a whole new level with its performance and value. This baitcasting reel has a sleek shape and a fascinating exterior design. And has a redesigned high-efficiency gear (HEG) system This system offers it an unparalleled strength and rigor for long-lasting use. As the name implies, it is designed to work effectively when fishing freshwater and it is also a great fit for bass fishing. The Shimano CAENAN A Low Profile Baitcasting Freshwater Fishing Reel features a variable brake system (VBS) which makes a perfect combination with the Shimano stable spool design (S3D). This perfect combo offers an exceptional casting operation. 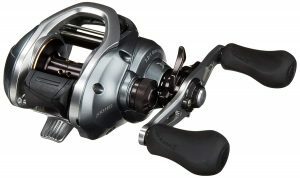 The Shimano CAENAN A Low Profile Baitcasting Freshwater Fishing Reel features a gear ratio of 7.2:1 and weighs 7.20 ounce. 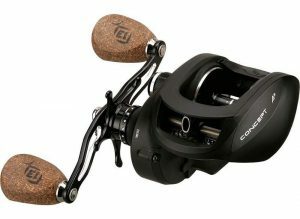 It features three Monoline capacity and three PowerPro Line Capacity along with a Line retrieve per crank of 30 inches. It has a maximum drag force of 11 lbs, 4 ball bearings, and 1 roller bearing. The KastKing Royale Legend/Whitemax Low Profile Baitcasting Fishing Reel is another fantastic product from the KastKing manufacturers with excellent features at such a very affordable price. It delivers smooth and reliable performance and has been chosen as a favorite by some anglers. This fishing reel will get you fishing all day comfortably with its EVA foam soft grip handle which ensures a firm grip and reduces any tendency for fatigue. Its interesting features include the following. This KastKing Royale Legend Baitcasting Fishing Reel features an 11+1 shielded MaxiDur ball bearing which is corrosion resistant and ensures easy casting performance, smooth retrieve and longevity. This amazing feature of the reel is responsible for its durability and ruggedness. This feature gives the reel maximum strength with reduced weight and makes it suitable for fishing he big games conveniently. The KastKing Royale Legend/Whitemax Low Profile Baitcasting Fishing Reel features a carbon fiber drag system which is very strong and can deliver up to 17.5 Lbs. This is an exceptionally great feature by this reel even at that low price. 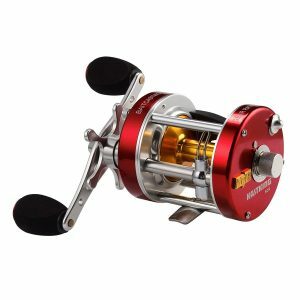 Just like the other KastKing fishing reel, this reel is also very versatile as its usefulness extends to both freshwater and saltwater fishing. This is because it is corrosion resistant. It is suitable for virtually every fishing technique including flipping, casting, pitching and more. It can also be used for bass fishing, ice fishing, kayak fishing, trout fishing, and lots more. 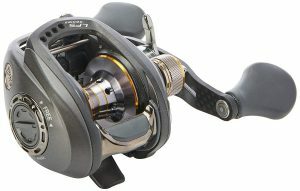 This legendary reel features a 10-level dual brake system, that is, the magnetic and centrifugal brake system which is easy to adjust and apply. This perfect combo helps you to achieve greater casting control and remove any tendency of backlash. With its 7.0:1 gear ratio, 11+1 noise free Maximus bearing which is corrosion resistant, ceramic line guide (monofilament line and braided fishing line compatible), this reel delivers high-performance results that are unmatched. This gives you more cranking power and the ability to perform different forms of rigs, jigs, and baits and enjoy a lifetime of fishing the big games with this reel. As the name implies, the KastKing Rover Round Baitcasting Reel is claimed to be one of the best reels out there. This high-quality reel is employed by most anglers to cast the bait in the water during fishing times. One of the most interesting qualities of this reel is that it can be used in all types of water and suitable for bass fishing. On Amazon, the reel is rated number 1 and being boasted of by its manufacturer as to the fact that it is unparalleled. KastKing Rover Round Baitcasting Reel’s bullet proof ability is very amazing. This is due to its reinforced hard anodized aluminum side plates and spool. It is very rare to see reels with this feature. This reel was proudly designed by manufacturers to be ergonomic and put the comfort of the angler in check. It is also quite rare to see most fishing reels put ergonomics in their design. The non-slip handles of this reel are designed to avoid slipping off from your hand when in use. It was also built in such a way that reduces lethargy and exhaustion making it your best choice for long hours fishing adventures. The KastKing Rover Round Baitcasting Reel is solid. It is designed with a strong fiber drag system which enables you to fish the big games and drag up to 9kg of weight. It does not easily get destroyed when subjected to heavy weight. Another incredible advantage of this reel is its versatility as it can be used for both freshwater and saltwater fishes. It is very resistant to corrosion because it is made of stainless steel and this makes it suitable for saltwater fishing. Efficient for trolling or bottom fishing. Abu Garcia BMAX3 Max Low-Profile Baitcast Fishing Reel brings to you the performance you look forward to in a lightweight and sleek design. It is designed to withstand rough handling and rugged fishing conditions. It has unique features built into it, and the whole structure of this reel is designed with simplicity. Unlike other baitcasting reels, this reel features a power disk drag system which provides an efficient and reliable drag performance through the entire drag process. The MagTrax break system of the Abu Garcia BMAX3 Max Low-Profile Baitcast Fishing Reel provides an efficient brake pressure and customizable cast control and helps to reduce the tendencies of experiencing backlashes during fishing. This feature in the Abu Garcia BMAX3 Max Low-Profile Baitcastfishing reel makes it lightweight and offers a reduced weight needed for the best balance. The Abu Garcia BMAX3 Max Low-Profile Baitcast Fishing Reel offers a couple of exquisite features which include Mono Capacity of 145YD/12LB, Braid Capacity of 140YD/30LB, the gear ratio of 6.4:1, 4 stainless steel ball bearings and 1 roller bearing. It also features a compact bent handle and recessed reel foot which gives a comfortable grip when handled. It has the dimension 8 x 5.8 x 2.2 inches and weighs 8.8 ounces. It is suitable for bass fishing and freshwater fishing. A lot of anglers grew up fishing spinning reel alone whenever they go out to fish. However, using a high-quality spinning reel and baitcasting reels would work to be one of the perfect combos to use as an angler. It would make you be that multi-talented angler you want to be. If you match a baitcasting reel with a good rod, you will derive a large amount of benefit that would surpass that which you would get using spinning gear. They are perfect tools to use for making hardjigs and baits, and no other can definitely surpass them. 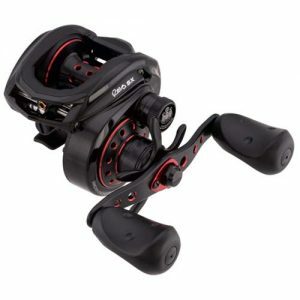 Their design and spool layout lend to them the capability of extra strength as compared to spinning reels. 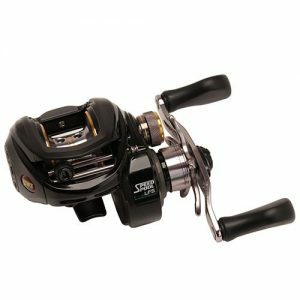 This is also because the handle and the gears of baitcasters is in good alignment with the spool and this helps the reel to be able to apply extra power and torque. Using a good baitcasting reel supplies a good level of casting control and helps you improve your fishing accuracy. This is mainly because you can adjust and control the speed and distance of your lure when casting with by holding the spool with your thumb. After a good period of use when you have become proficient in using it, your casting accuracy would have improved. Therefore, you can pinpoint easily with high accuracy thus enabling you to throw the lure to the exact location of the fish. One of the things for which spinning reels are commonly known for is line twist which is a major hindrance to good casting. Baitcasting reels have been designed to eliminate such occurrences of line twist, and therefore, the only twist you would experience in your line would be from your lure.